There’s a reason I got as excited as I did when I discovered Urfa Tomato Kabob in Penn Quarter last year – Turkish cuisine is still woefully underrepresented in the DC dining scene. But not for long. This week, a taste of Turkey arrived in Dupont Circle in the form of Agora. If you’ve ever made the trip out to Vienna to taste the authentic Turkish flavors at Nizam’s, you’ll be thrilled to know that Chef Rasit Gulsen is heading up the kitchen in the new 17th Street restaurant. And if you’ve found yourself wondering how Turks can live almost exclusively on kabob and pide, Agora has the answer you’ve been looking for: seafood. The riches of the Mediterranean make up a sizable portion of Agora’s menu in a variety of presentations that is likely to surprise most DC diners. I stopped by Agora just as they were putting the finishing touches on the decor and the kitchen, getting ready for their big opening this week. While I was there I had a chance to take a look around, take some pictures, and even get a look at their menu. Have you been watching Top Chef Masters? Even though Susur Lee is credited as representing Toronto, the highest-scoring chef in the show’s history has a connection to Washington in the form of his newest restaurant. Zentan at the Donovan House features Lee’s take on refined (and redefined) Asian cuisine. 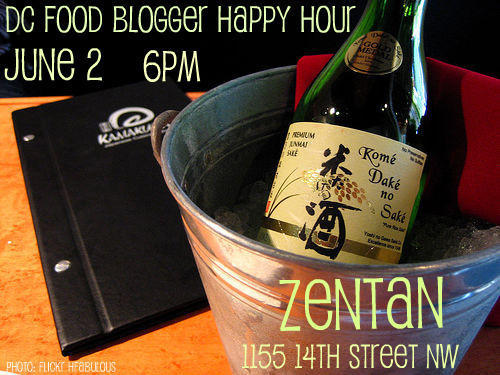 To celebrate Lee’s performance – and to enjoy another new hot spot with friends – the DC Food Blogger Happy Hour will take place at Zentan next Wednesday, June 2nd. We’ll get started at 6 PM and run until at least 8, and we’re going to be in the restaurant’s private dining room. 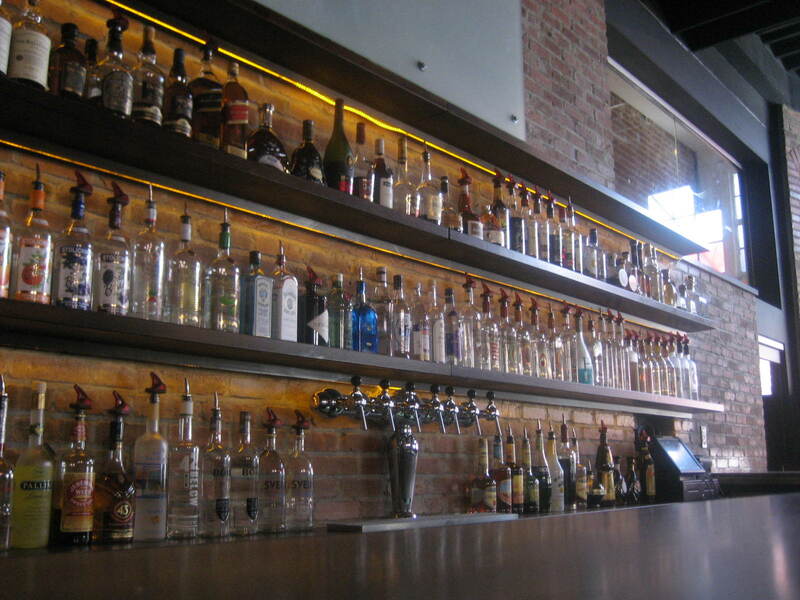 Happy hour specials will include $7 beers, $7 glasses of wine and $7 specialty cocktails. If you’re feeling hungry, be sure to check out some of their sushi or go all out and order the nineteen-ingredient Singapore slaw. We’ll also be there during their regular “Lucky 7’s” happy hour, so we’ll be able to enjoy $7 small plates that run the gamut from steamed pork dumplings to fluke sashimi. As always, we ask that you join us on our Facebook page to let us know if you’ll be able to attend. We’re already at 45 guests and counting, so this one should be BIG! While you’re there, take a moment and let us know where you would like to do a future Food Blogger Happy Hour – chances are you’re not alone. Okay, first things first: do you have any idea how tough it was not to make a “Domo arrigato” pun on robatayaki or to rhyme “Kushi” and “sushi” in the title? Anyone who knows me knows that this is either an indication that I’m growing as a person or a case of me being paralyzed by too many options. I’m guessing the latter. In any event, I’ve been looking forward to writing about Kushi since I found myself near the Convention Center at lunchtime a few weeks ago. The restaurant bills itself as an izakaya, a “sit-down sake shop.” In practical terms, it’s a full-service Japanese restaurant that offers sushi, grilled and skewered entrees and an impressive beverage menu. That diversity allows for a wide range of experiences depending on what you’re in the mood for. 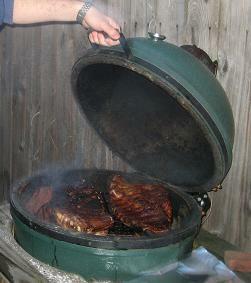 Looking for a few tender, savory skewers or charcoal grilled items to tame your appetite? 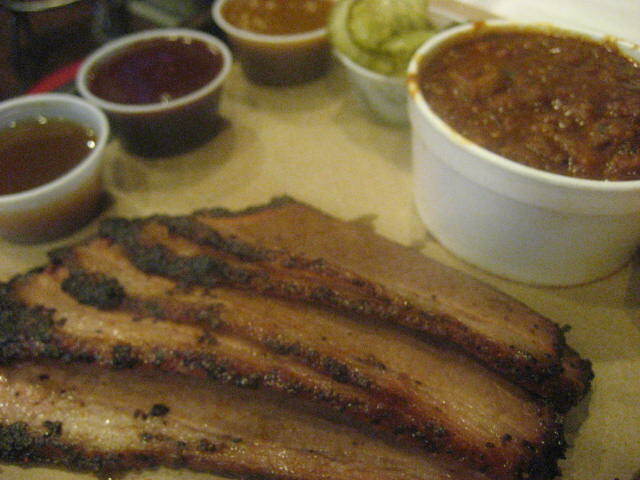 Pull up a stool at the first counter, where you can watch them prepared and cooked before your eyes. 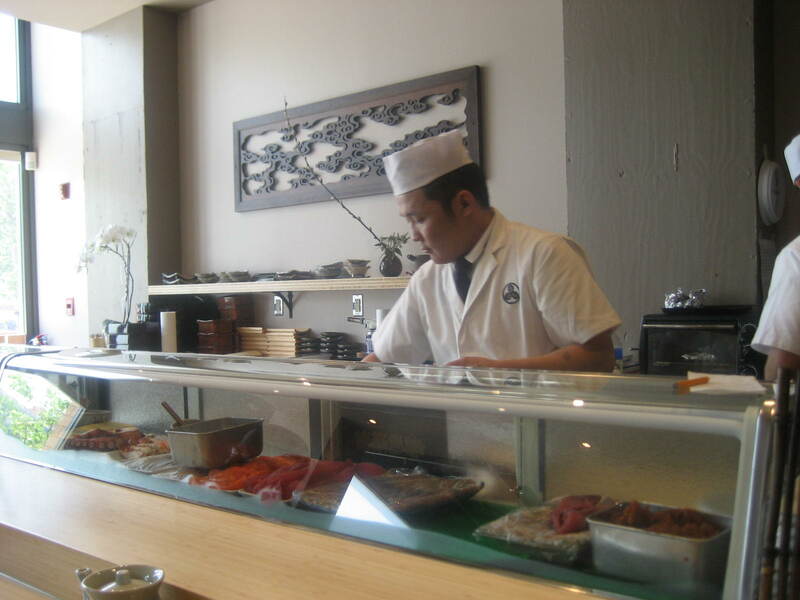 Eager for some a la carte sushi? There’s a second counter at the back of the shop for that. And there’s table seating throughout the space if you want a little of both and some more besides. I walked in by myself for lunch, and I was invited to grab a seat at the sushi counter. 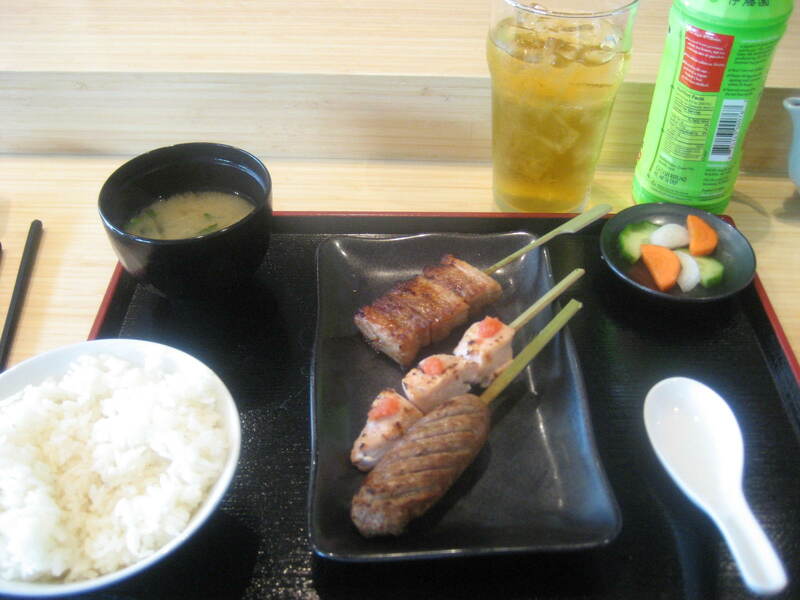 Sushi sounded good (and looked better), but a quick read through the lunchtime menu convinced me to try a trio of skewers. The combination of price and selection was just too tempting to resist. In 2008, date planners everywhere suffered a major loss when a kitchen fire closed Ristorante Piccolo. But rejoice, incoming romantically inclined interns! Piccolo has finally re-opened. 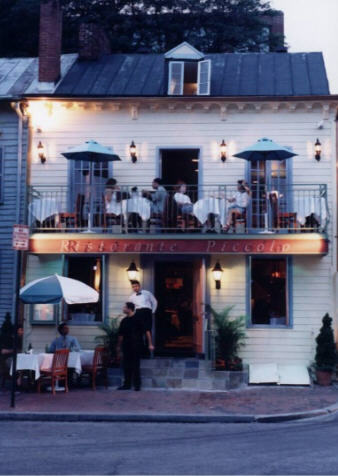 Built into a townhouse on 31st Street in Georgetown, Piccolo is a pleasant stroll from the hubbub of M Street NW. With a classic Italian menu and intimate two-person tables on the second-floor balcony, Piccolo’s return continues to strive for a romantic setting. The interior boasts walls with a warm glow and soft acoustic guitar recordings play throughout the dining room. The menu will be comfortable to anyone familiar with Italian-American food, with no real surprises but a solid showing of classics. Romance and budget can live in harmony for diners willing to head out before May 23rd: Ristorante Piccolo is taking part in a Tastings Journal promotion featuring a 5-course tasting menu (one glass of wine included) for $45. I visited the restaurant last week with some co-workers, willing to test my third-trimester appetite against all five courses. The first course’s bruschetta had a surprising kick to it with the tomatoes giving way to a welcome spice not typical in bruschetta. Flavors settled down for a creamy lobster bisque featuring a few lumps of lobster meat. My third course, spaghetti with a tomato reduction and pesto, mixed flavors nicely though not so well that I wanted to push myself to finish the bowl. (As a brief aside, I was pleased to see the bowl of pasta served with a spoon and fork, spoons making it so much easier to twirl pasta appropriately.) By the fourth course, fresh tortellini stuffed with cheese and tossed with seared jumbo shrimp, I was starting to fade. My stomach was running out of space and my short-sighted menu selections seemed to concentrate on only the richest of each course options. By the time the desserts came around, I barely mustered the spirit to try a bite of each…though I did note with satisfaction that the tiramisu had the familiar tang of ladyfingers soaked in espresso (a step I think many restaurants skip). I’m glad Ristorante Piccolo is back on its feet. Though they desperately want to carve a niche as one of the most romantic dining options in Georgetown, I’m reluctant to vote for them for the title. The spotty service we received (a waiter who didn’t know what pasteurized meant, two others who were unable to break a $20 when the bill came, having to request the wine that was supposed to come with our fourth course rather than be reminded of this included benefit) kept me just a little on edge. Still, if they can work out the kinks I’d heartily recommend the restaurant for those evenings out when you need a solid but safe menu of familiar Italian dishes. 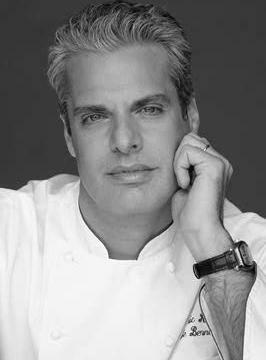 Interview with Eric Ripert: Avec No Reservations! That’s right. Bourdain and Ripert. Onstage. Together. Just hanging out, you know, like a pair of bros. And you can join them (maybe even ask them a question if you get lucky). It’s a total foodie geek-out opportunity, and the bonhomie between the two chefs pretty much guarantees it’s going to be a good time. To this day one of my favorite episodes of “No Reservations” involved Bourdain getting back on the line at Les Halles and eventually being joined by Ripert on the fish station. Grub Street has a great reminder of just what fun the episode was to watch. Capital Spice: Good afternoon, Chef. Thanks for talking with us today. We’re already looking forward to your show on Friday night – what can you tell us about it? Eric Ripert: It’s going to be a lot of fun. The setup is one of a moderated conversation, with a question and answer period at the end. CS: Can you give us an idea of what you’ll be talking about? ER: It’s hard to say…for us, it really is going to be a conversation, and we have a very easy dynamic. But I expect we will be speaking about things like the current state of “fine dining” – what it means today, the state that it’s in. Of course, we’ll likely also talk about things like Top Chef, so there will be something for everyone. CS: It looks like you’ve only got two of these evenings scheduled (the second is in Baltimore on Saturday night). What made you pick DC for this? ER: Washington is an easy choice – it’s relatively close to New York, where Tony and I are both based, I have a restaurant here, and it is a city that enjoys good food. <<EDIT 12:24 PM, 5/13/10 – Sorry for the confusion – I listed the address as NE, not NW, but I’ve corrected it. If you’ve ridden the Circulator from Union Station to Georgetown or driven along Massachusetts Avenue near Chinatown at any point in the past year or so, you’ve been tantalized with a large advertisement for Buddha Bar in the ground-floor windows of 455. The gigantic space has been a work in progress for almost twice that long, but the wait is finally over. 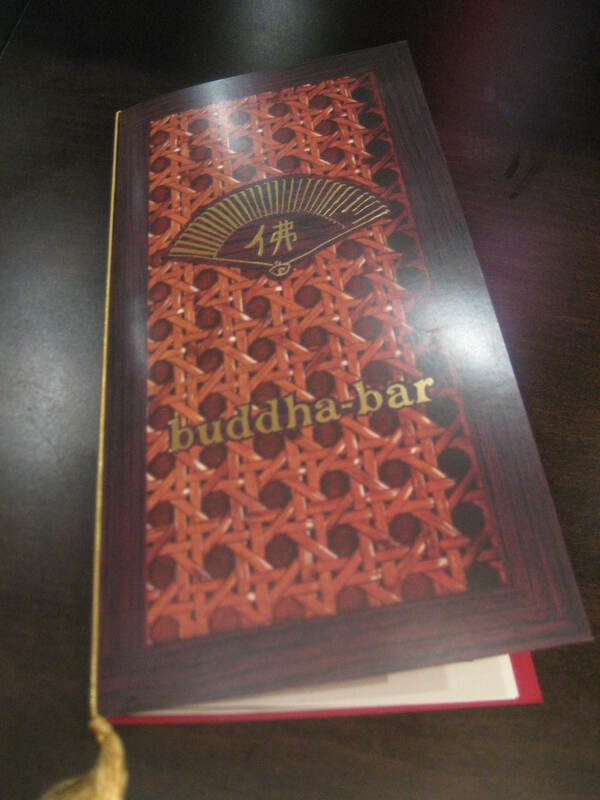 Buddha Bar opened for dinner service last night and is now ready for business. Maybe you’re familiar with their popular series of music compilations. 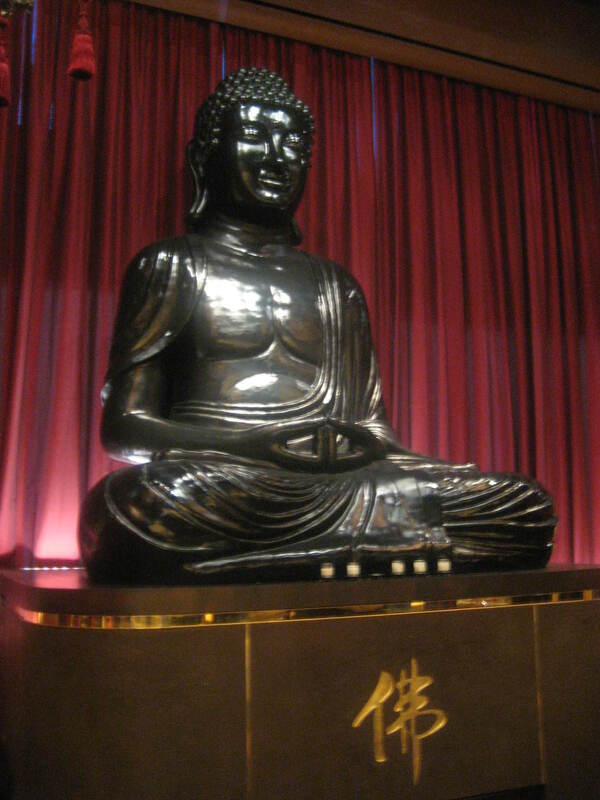 Perhaps you’ve paid a visit to Little Buddha in Las Vegas or the original Buddha Bar in Paris. Or maybe the Washington outpost of this global lounge and restaurant concept (branded as “eatertainment”) is your first experience with the concept. Whatever your level of familiarity with Buddha Bar, prepare to be impressed.